Fully enclosed Gazebo sits on any flat surface. Flagpole with bell on top (included) can be used as a cat or dog toy. 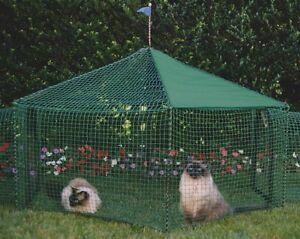 Let your cat relax in the fresh air, watch the birds, exercise and enjoy sunshine without the risks of escape or injury!